Arthur Richard Dobier was born on 10 July 1891 in Timaru. He was the son of Fanny Dobier of 17 Russell Square Timaru NZ and the late Thomas Dobier. Arthur DOBIER attended Timaru South School and is mentioned in Papers Past (Timaru Herald), for achieving his standard four certificate. Arthur had two known brothers Ernest and Jack and a sister Doris. Arthur and his brother Ernest were living in Christchurch at the start of World War One in 1914 (according to NZ Electoral Rolls). Arthur was living at 249 Gloucester Street Christchurch and was working for Thomas Armstrong’s Department Store and Drapers. Arthur enlisted into service on 18 October 1915 and left from Wellington to Suez Egypt on 8 February 1916. After a reformation of troops Arthur then joined the Canterbury Infantry Regiment (CIR), 2nd Battalion and sailed to Marseilles, France in April 1916. Arthur trained for the front lines, and spent three months guarding a quieter sector of the frontline at Armentières. The NZEF maintained an infantry presence in Étaples where troops were housed on their way to the Front. 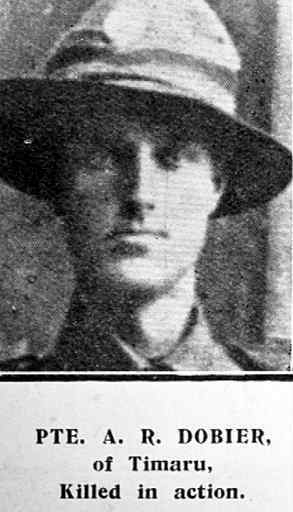 Arthur was admitted to the NZ field hospital on 16 May 1916 for influenza, but rejoined his unit after a few weeks recouperation on 3 June 1916 in Rouen France. Arthur and his unit was subsequently involved in attacking the enemy on the 15 September 1916 during the battle of the Somme, around Longueval. The NZ Division needed to capture the village of Flers-Courcelette from the Germans. The NZ Division achieved their objective but with the heavy cost of the loss of 2000 men. One of those men was Arthur Richard Dobier who, during this period, was killed in action in the field on 16 September 1916.